When I tried to think of something for this week's Illustration Friday topic this quickly sprang to mind. I know I've pluralised the topic to "Acrobats", but maybe if you just focus on the top guy :). 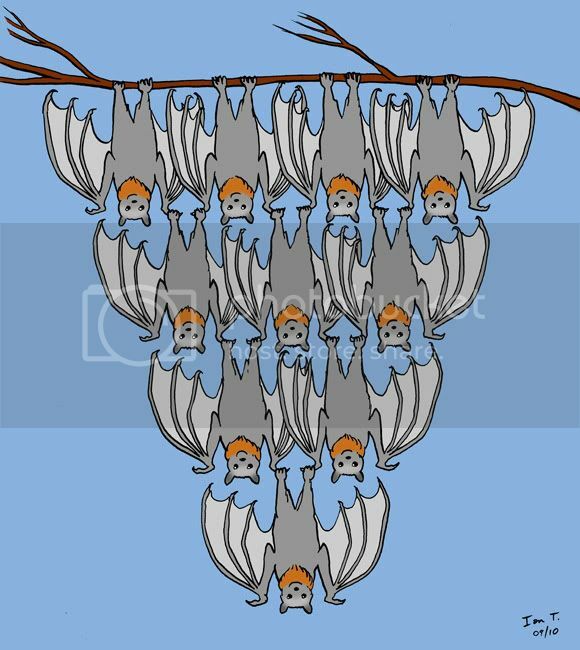 This is the flying fox equivalent of a human pyramid. My intention was to render fur on the original sketch to make a complete black and white picture, but I scanned it in and added these colours instead. Maybe I will still finish the sketch in black and white as well, I dunno. ha ha. inverse human pyramid. very very cool! Very cute picture! Can they do that while in the air, too? Ooh, bat teamwork! Like their little bearded, smiling faces. Amy, it hadn't occurred to me they might look bearded - they're Grey-headed flying foxes, a familiar, if endangered, local species with an orange neck ruff - but it kind of fits :).